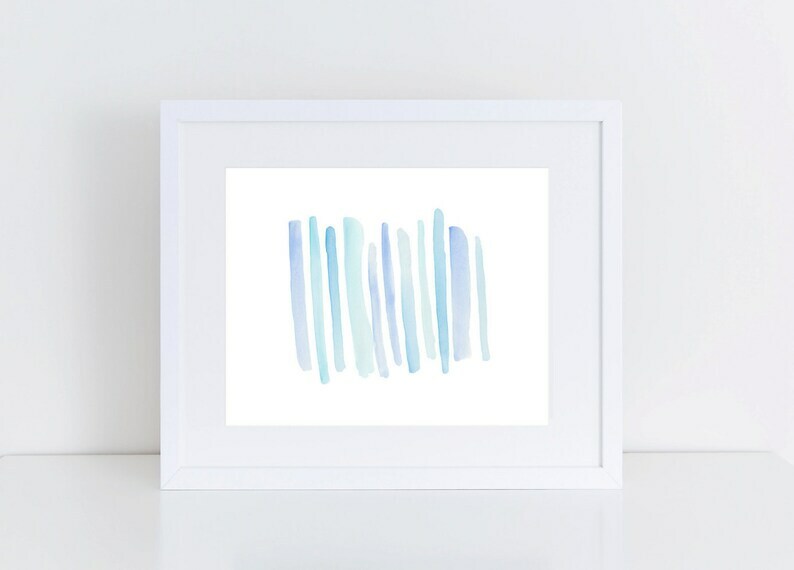 Blue ombre abstract watercolor print is perfect for a gallery wall or with other photos and collectibles. The blue ombre watercolor will look great in almost any room. I created this print with watercolor and a paintbrush. If you love this watercolor print and would like a custom color or size, send me a message, I'd be happy to help! This blue watercolor gallery print was designed to hang alone or pair with this print in my shop: https://www.etsy.com/listing/467759992/blue-abstract-circles-watercolor. I also sell prints of this watercolor painting, check it out here: https://www.etsy.com/listing/450654456/blue-abstract-ombre-watercolor-print. Once you purchase, you will receive a download link via email. Click the link and follow along to download and save. You will receive 2 print sizes, 5x7 and 8x10. Save to your computer and print as needed! You will not receive a physical print, this listing is for download only and does not include the frame. The mockup of the print in the frame is for visualization purposes only.